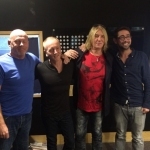 Def Leppard members Joe Elliott and Phil Collen were interviewed by Talksport's Colin Murray today and said there will be UK shows in 2015. Joe had already confirmed plans during this interview in July. Everyone is saying come on play gigs here please in 2015. Is that gonna happen? Phil - "Absolutely yeah. World tour actually so we're actually doing a lot..."